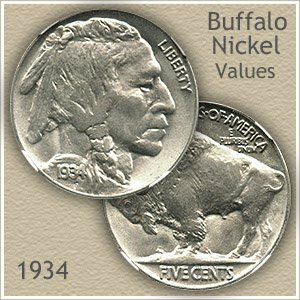 The 1934 nickel value ranges from 89 to 95 cents for a well circulated coin to over $55 for the elusive 1934-D Buffalo nickel in "Uncirculated" condition. The visual appeal of the series and the large numbers of collectors assembling collections has driven values up. Certain date and mintmark combinations are especially elusive. 1934 nickel value is stronger for the Denver mint coins of this year. The "D" mint Buffalo's are scarce. The Philadelphia mint coin, although less in value is a close second with respectable prices in higher circulated condition. The reality is all of these now old Buffalo nickels are worth significant premiums. Referring to condition, it is an important point to consider. 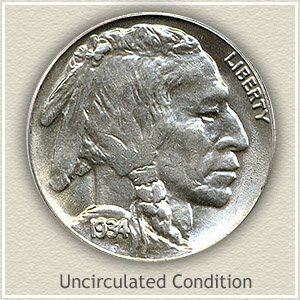 The "Uncirculated" 1934 nickel pictured is highly prized by rare coin dealers because of condition. Huge swings in value follow the better condition coins. There are "Grading" images below to help guide through this part of determining value. 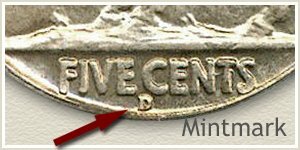 The 1934 "D" listing is a coin minted in Denver, the "S" indicates San Francisco, and no mintmark was used by the Philadelphia mint. Find mintmarks on the reverse below the mound along the rim. The coin values chart covering four grade categories highlight values of better condition nickels. Poised to add the centerpiece to an elite collection, price was not an issue for one determined Buffalo nickel collector. 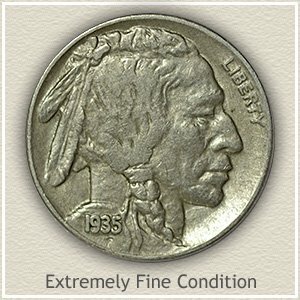 Bidding $2,150 was required to include one of the worlds finest quality 1934 nickels to their holdings. Fortunate mark and abrasion free Indian and Buffalo enhance the sparking blue-silver luster radiating from every device. Placing this desirable condition rarity in an elite category all its own. Any 1934 nickel of this quality is rarely available, and quick action is needed to collect a seldom presented opportunity. Of the many variables considered as you value your old nickel, accurate "grading" of its condition is one of the more challenging. Compare your coins to the images, and with a little study, it is possible to identify those in the valuable, higher grades. Fine: Also a collectible grade for a 1934 nickel from the Denver mint, the coin has a pleasing but worn appearance. A full bold date with legends separated from the rims, increases this grade from a lesser one. Design details are visible on both the Buffalo and Indian. Check all your buffalo nickel values with the coin value chart and separate the common from the rare. Rising prices, increasing demand from both collectors and rare coin dealers requires a second look at your coins. Including more relating to your 1934 nickel value. These old Buffalo nickels are becoming valuable. Easily find how much your old coins are worth. Coin Values Discovery... finds the 1934 nickel value and... all old US coin values. It is an excellent index with images and text links to all coin series, from Cents to Gold. Coin Value Charts, grading images and descriptions uncover how much your box of old coins is worth.